There is no amount of preparation or strategy that could make up for the absolute downpour weather that hit the Floridian peninsula on Sunday morning and threw about forty wrenches into the works. 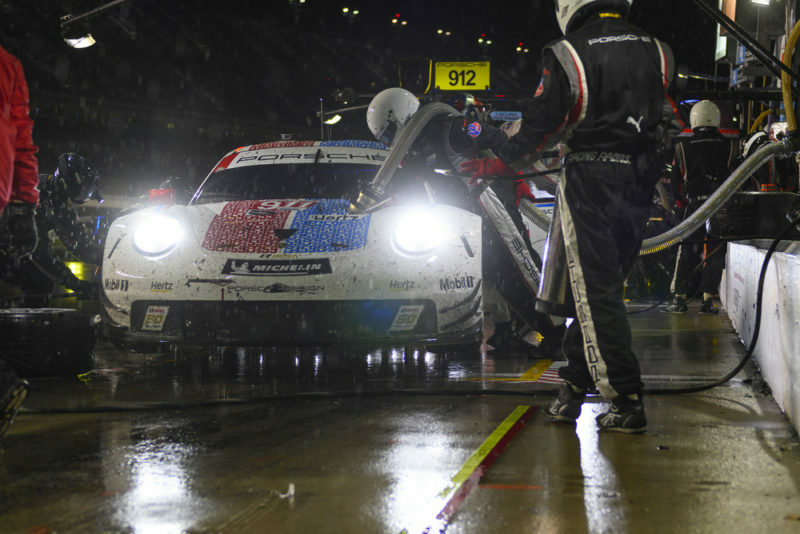 Porsche ran a strong 24 hour race in the dry, but suffered mightily in the rain, as the track was a complete mess. Porsche managed to come out of it with a podium place, but both team cars were running 1-2 a few times throughout the race. It's hard to call this a great finish, but the battle that raged in GTLM for the full race length was definitely one of the most exciting in recent memory. With competition from Ford, Corvette, BMW, and Ferrari, there was never an inch to put a foot wrong. Porsche had to be perfect the whole race, and they nearly managed it. Visibility was practically zero on Sunday morning, as you can see from the video below of the WeatherTech Ferrari running headlong into the Black Swan Racing GTD Porsche. It was wise of the race stewards to throw a red flag in the early hours of Sunday morning, but it was absolutely unwise of them to throw the race back to green with little warning. The drivers said they didn't even have time to warm up their brakes, just thrust into the fight on a whim. The rain wasn't the worst part, though, it was the spray of standing water kicked up by other cars. It was just a mess for the final few hours, and probably should have been called earlier. Saturday was an absolute proof of concept for Porsche. Flying away from the pole position, Nick Tandy was in a great position. The GTLM-class #911 Porsche 911 RSR ran up front for much of the first half of the race. Patrick Pilet and Fred Mako worked well with the car and the dry conditions. The Porsche clearly had speed in hand, running fast on the high banking, but not giving up anything on the infield either. When I went to sleep at the half-way point of the race, the team was still leading. In fact, they were still well up the order when I woke early the next morning, but a hydroplaning incident that saw the car slide into the back of one of the Ford GTs as they fought down to the millimeter for advantage at turn one was a turning point for the #911. The team recovered to fifth, but the race was red flagged shortly thereafter. Porsche #912 had a vastly different race this weekend, as Earl Bamber, Laurens Vanthoor, and Mathieu Jaminet suffered horrible luck in the early runnings. With an issue in the car's front splitter mount, the team wheeled back to the garage to affect repairs. When they returned to the course, the car was four laps down. Luckily, with IMSA's wave-around rules, and stellard driving and strategy, the team was able to recover to the lead lap by the mid-point of the race. The car sat in fourth, still on the lead lap, when the final red flag segment was called. The #67 Ford GT had pitted for emergency fueling during a full course yellow, which is allowed, so long as the team pits again for a full fuel up when the pits open. Between the emergency fill and opening the pits, the red flag was thrown and Ford couldn't come back in for the full service. They'd been in second place, but were handed a penalty for the unserved fuel stop, which relegated them to fourth, behind the #912 Porsche, handing them a podium place. In the GTD class, Porsche's luck was even worse. The new-for-2019 GT3 R was fast and had plenty of power, but a seriously competitive GTD field and poor luck relegated the best finishing example to 8th. The Park Place Motorsports car had taken a full pit stop under green flag running just before the final caution, and subsequent red flag flew. If they'd been another two laps or so to the good, they'd have finished much higher up the running order. That's how the cookie crumbles, I guess. Black Swan, as seen in the video above, got rear ended at high speed, putting them out of the race late in the running. Similarly, on the initial failed restart from red flag conditions, the rad-in-plaid Pfaff Motorsports GT3 R ran headlong into a very slow Lamborghini to end their race prematurely. The NGT Motorsports car suffered a spin early on, and within a few laps had a complete engine failure, dumping fluids all over the track. 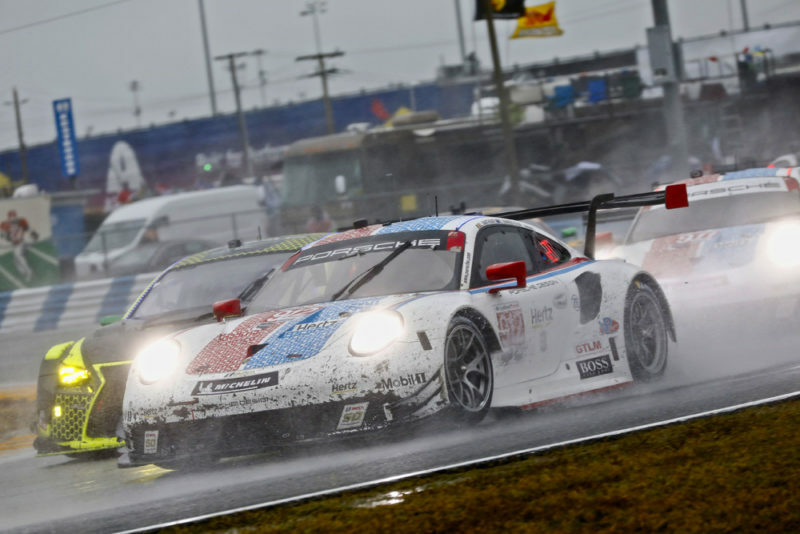 Porsche remains optimistic headed into the 12 Hours of Sebring in March. Some people lead a charmed life…in awful conditions!